Home » mass flow » How Can We Protect Against Mass Movement Disasters? Clearly, landslides, mud-flows, and slumps are natural hazards we cannot ignore. Too many of us live in regions where mass wasting has the potential to kill people and destroy property. In many cases, the best solution is avoidance: don’t build, live, or work in an area where mass movement can take place. But avoidance is possible only if we know where the hazards are. To pinpoint dangerous regions, geologists look for landforms known to result from mass movements, for where these movements have happened in the past, they might happen again in the future. Features such as slump head scarps, swaths of forest in which trees have been tilted, piles of loose debris at the base of hills, and hummocky land surfaces all indicate recent mass wasting. Surface features warn that a large slump is beginning to develop. Cracks that appear at the head scarp may drain water and kill trees. Power-line poles tilt and the lines become tight. Fences, roads, and houses on the slump begin to crack. In some cases, geologists may also be able to detect regions that are beginning to move (figure above). For example, roads, buildings, and pipes begin to crack over unstable ground. Power lines may be too tight or too loose because the poles to which they are attached move together or apart. Visible cracks form on the ground at the potential head of a slump, and the ground may bulge up at the toe of the slump. 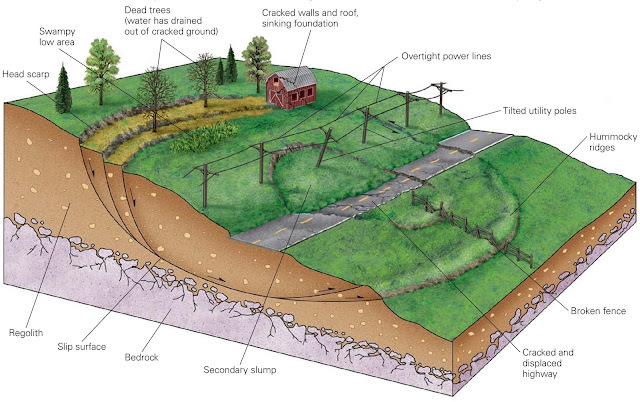 In some cases, subsurface cracks may drain the water from an area and kill off vegetation, whereas in other areas land may sink and form a swamp. Slow movements cause trees to develop pronounced curves at their base. More recently, new extremely precise surveying technologies have permitted geologists to detect the beginnings of mass movements that may not yet have visibly affected the land surface. 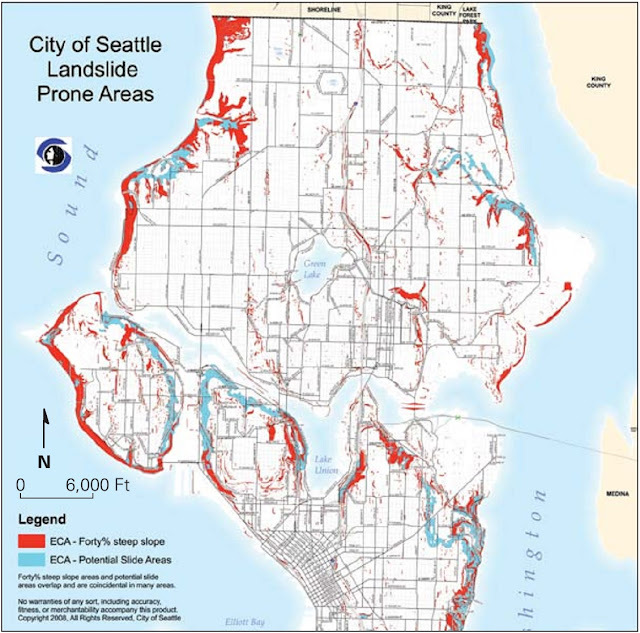 A landslide hazard map of the Seattle area. Even if there is no evidence of recent movement, a danger may still exist: just because a steep slope hasn't collapsed in the recent past doesn't mean it won’t in the future. In recent years, geologists have begun to identify such potential hazards by using computer programs that evaluate factors that trigger mass wasting. These factors include the following: slope steepness; strength of substrate; degree of water saturation; orientation of bedding, joints, or foliation relative to the slope; nature of vegetation cover; potential for heavy rains; potential for undercutting to occur; and likelihood of earthquakes. From such hazard-assessment studies, geologists compile landslide potential maps, which rank regions according to the likelihood that a mass movement will occur (figure above). In any case, common sense suggests that you should avoid building on or below particularly dangerous slide-prone slopes. In areas where a hazard exists, people can take certain steps to remedy the problem and stabilize the slope (figure above a–h). Revegetation: Stability in deforested areas will be greatly enhanced if land owners replant the region with vegetation that sends down deep roots and binds regolith together. Regrading: An over-steepened slope can be regraded or terraced so that it does not exceed the angle of repose. Reducing subsurface water: Because water weakens material beneath a slope and adds weight to the slope, an unstable situation may be remedied either by improving drainage so that water does not enter the subsurface in the first place, or by removing water from the ground. 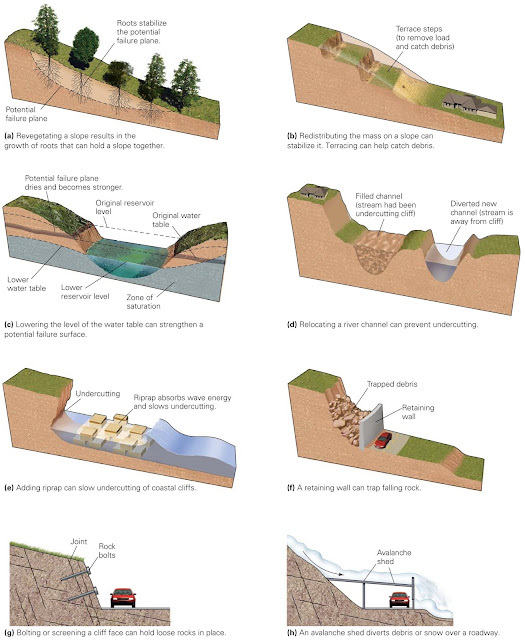 Preventing undercutting: In places where a river undercuts a cliff face, engineers can divert the river. Similarly, along coastal regions they may build an offshore breakwater or pile riprap (loose boulders or concrete) along the beach to absorb wave energy before it strikes the cliff face. Constructing safety structures: In some cases, the best way to prevent mass wasting is to build a structure that stabilizes a potentially unstable slope or protects a region downslope from debris if a mass movement does occur. For example, civil engineers can build retaining walls or bolt loose slabs of rock to more coherent masses in the substrate in order to stabilize highway embankments. The danger from rockfalls can be decreased by covering a road cut with chain link fencing or by spraying road cuts with concrete. Highways at the base of an avalanche-prone slope can be covered by an avalanche shed, whose roof keeps debris off the road. Controlled blasting of unstable slopes: When it is clear that unstable ground or snow threatens a particular region, the best solution may be to blast the unstable ground or snow loose at a time when its movement can do no harm. Figures credited to Stephen Marshak. Islamabad Airport is inferred in the business as a champion among the most worshiped auto rental associations for its best quality vehicles that are sufficient kept up and controlled by the careful and arranged escorts. Islamabad rent a car Various visitors who visit Islamabad from inside the country or the remote voyagers exploring the paradise lines of capital city of Pakistan pass on different substance recollections with them of the quality associations they get from the connection. Online MCQs quiz Test and all other learning Information here. All Geologylearning Questions with Answers are here. 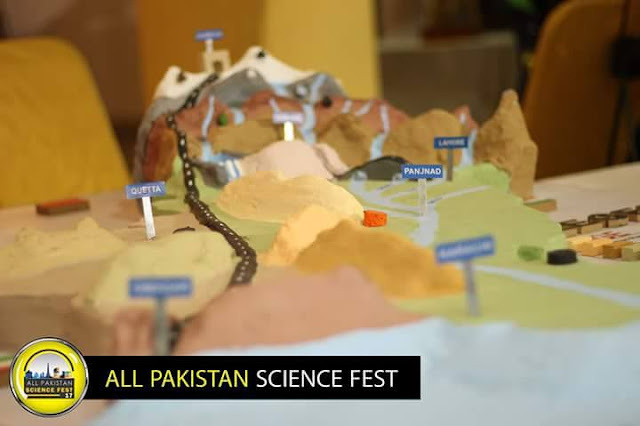 So, You can easily Learn about the Geology Study Online here. Thank you for this information. Online MCQs Quiz Tests For the preparations of the MCQs. All type of MCQs are solved with online Answers. You have to need only get and start Test for the quiz online. Why Do Mass Movements Occur?